Size: 4 years. Bubs isn’t quite 2 and a half but she’s tall for her age. Thankfully there’s a bit of growing room left in the cardigan. 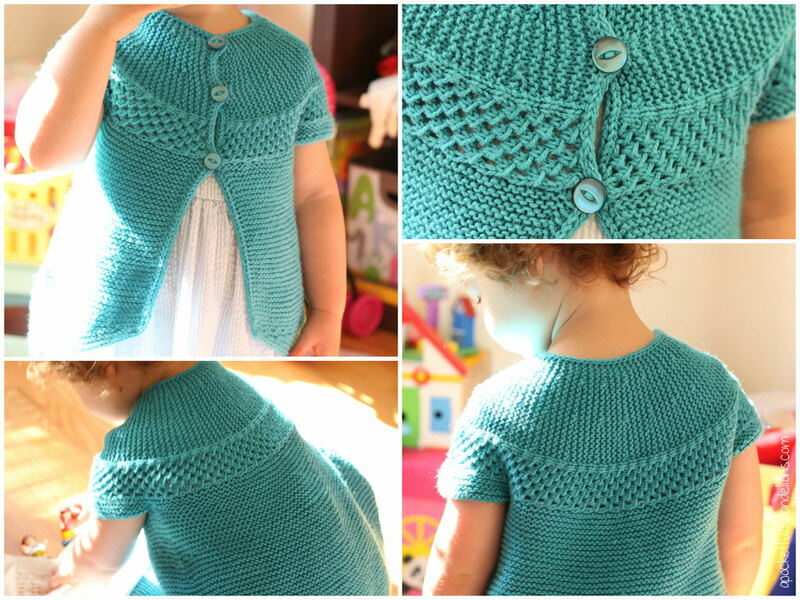 This is such a fun pattern to knit! I usually steer clear of garter stitch projects as I never like the feel of the fabric but this time it really works. 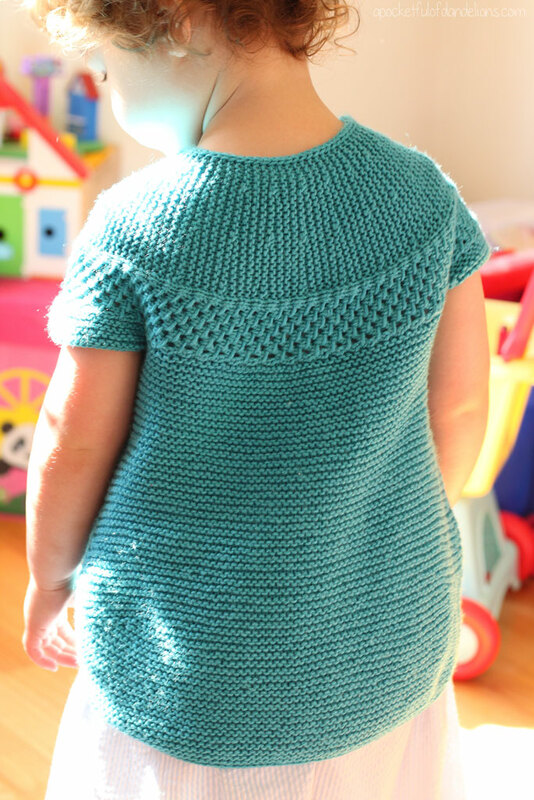 Bubs hates wearing anything with long sleeves so I cast-off after working one round on each sleeve but the rest was knit exactly according to the pattern. There are some interesting techniques which really held my interest and made up for the miles and miles of garter. 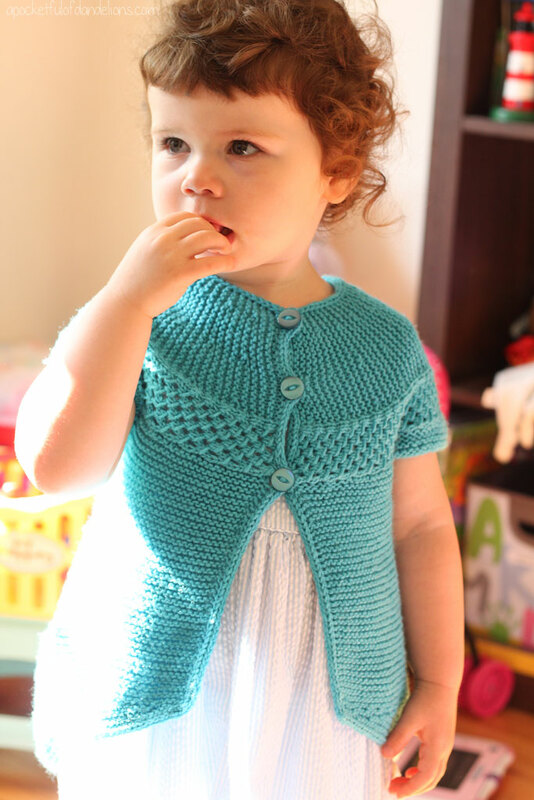 The cardigan is constructed from the top down but not in the usual way. The yoke is knit side-to-side and then you pick up stitches from the side of the lace panel, rotate your work and knit downwards to form the body. Short rows are used to create a curved hem and then there’s an i-cord cast-off, which I’d never done before. Now that I know how easy it is I’ll be using it more often. I would say this is an intermediate level knit but the pattern has very clear instructions for all of the techniques involved. Not just your girls, Bubs is an expert sleeve wetter. She gets her sleeve hatred from her dad, who wears short sleeve shirts in the depths of winter.